Hello all and Happy Valentine's Day! We are excited about 9 endurance rides in Oklahoma this year. All are sanctioned by AERC, OCER and MOTDRA. Discounts are given for pre entries, current OCER members, 2011 and/or 2012 ride managers, current OCER member-sponsor of a junior rider and for riding the 2nd day if you rode the 1st (does not have to be the same horse or distance). You may either RSVP to me (Susan Young) or pre enter. There is a 100% refund policy and entries will gladly be accepted in camp. OCER JUNIOR RIDERS RIDE FREE...ANY DISTANCE!!!!! OCER membership for a junior rider only is $5. If you are a non-OCER member, you may join with your pre-entry or in camp. If you are sponsoring a junior rider that joins OCER at the ride (or with the pre entry), the adult OCER membership is FREE (for first-time adult member)! If you are a non-family member of a junior you are sponsoring, your 2012 OCER membership is FREE (a $20 value). If you are a family member of the junior you are sponsoring, just pay the $5 junior membership and you will have an OCER family membership (a $25 value). The Summer Camp Series is scheduled for June 9 at Lake Oologah near Foyil (25/50), June 30 at Lake Carl Blackwell near Stillwater (30/50) and July 21 at Prague lake near Prague (30/50). There is a $30 discount for pre-entering the series and JUNIOR RIDERS RIDE FOR FREE!!!! This year we have included limited distance for all 3 rides. To be entered in the series, you must pre enter the same horse and same distance classification for all 3 rides. Once again, there is a 100% refund policy. You may substitute horses or riders or change distances but you won't be entered in the actual "series". Please contact Ride Managers Susan Young or Link Mock for fliers, entries and OCER membership form. April 21 & 22 -- Sooner State Spring Challenge Elevator I & II 25/50, Bell Cow Lake near Chandler, OK. Pre enter by 3/24. We plan on being at WOW! if you want to hand us your entry there. Summer Camp Ride Series (see details above). Pre enter by 5/12. We plan on being at True Grit if you want to hand us your entry there. October 6 & 7 -- 20th Annual Indian Territory Elevator Endurance Ride I & II 25/50/75 at Lake Oologah near Foyil, OK. Pre enter by 9/8. We plan on being at Kanapolis Canyons if you want to hand us your entry there. November 23 & 24 -- Season Finale OCER Benefit Ride I & II 25/50 at Bell Cow Lake near Chandler, OK. Pre enter by 10/26. We plan on being at Jo Tate Fall Paradise if you want to hand us your entry there. Come enjoy some great Nevada hospitality and join us for the 2012 Nevada Derby I & II Endurance rides. You can access it on the AERC calendar page, http://www.doublejoy.com/erol/Calendar/rides.asp?gs=aerc&dtSpan=2012&scope=_r®ion=w or our web site at http://www.nastr.org/ (under downloads). We are in the process of updating the site and making changes, so please check back frequently, to see what changes we’ve made. Something new this year is the addition of a 25 mile ride on Sunday. In years past we’ve only offered it for Saturday, but we will have it both days this year. We are also offering a 15 mile fun ride on Sunday, for riders and/or horses who aren’t quite ready for a 25/50 mile ride. This won’t be a timed event, just a leisurely trail ride. The Nevada Derby 50 Mile Ride (day one) is the first test in our NASTR Triple Crown - three rides, of increasing distance and difficulty, through Northern Nevada valleys, deserts, foothills, and mountains (Nevada Derby 50 / March 31st * NASTR 75 / May 27th * VC 100 / September 15th). We invite you to test yourself, and join us in the fun and challenge, as well as the special awards. NEWS BREAK... the NASTR 30/50/75 date has changed from June 9th to Sunday, May 27th ... YEAH ... Memorial Day Weekend. June was getting way too crowded, so the club opted for the May date. It will be a perfect time of year for the ride, not too hot yet, plenty of grass, and the wild flowers should still be in bloom. Mark your calendars with the date change, and join us for the 2nd leg of the Triple Crown. An additional bonus, both NV Derby 50 mile rides, the NASTR 50 & 75 mile rides, and Virginia City 100 are AHA sanctioned. Thank you, and we look forward to seeing you the end of March. 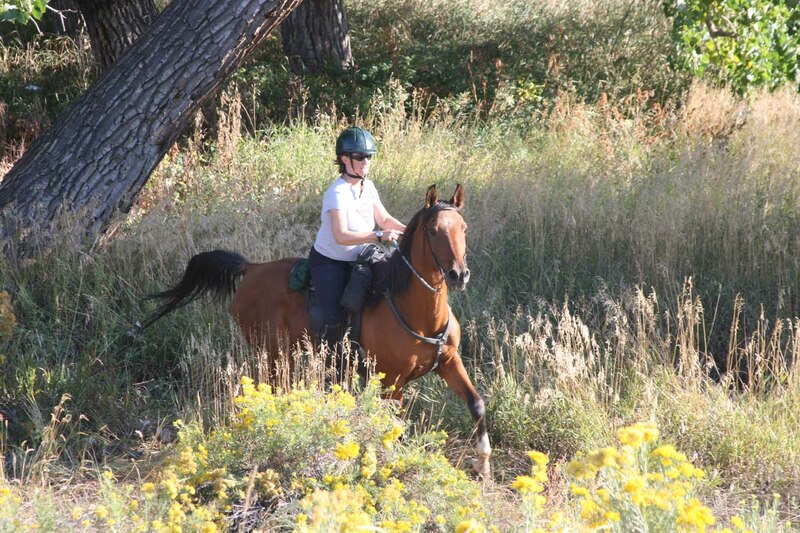 It's official... the Camas Creek Canter rides again! I am excited to announce that it is planned for Saturday, July 21, 2012. Doug and Jeanne Hall have generously offered to host the camp at their ranch again in Potomac, MT. As details become available, they will be posted on the ride website at www.montanaendurance.com For now the ride is sanctioned for one day. If I can gather the courage, find the volunteers, convince the land management agencies and balance the budget, I'll consider making it a two day, same trails ride. Happy New Year and welcome to winter, finally! The Kenlyn Urban Challenge 15/25/50 Endurance Rides will be held on April 21 and October 6, 2012, along the Sand Creek corridor that runs through Aurora to Denver. It is really very scenic - come and join us! For more information and an entry form, see http://www.kenlynarabians.com/ under the ACTIVITIES page.